There was no question I would like these scones. When I saw them on Nikki's blog, I knew I had to make them. Instead of the usual scone size and shape, I opted to make these into mini scones so I can try some portion control (which may or may not have worked lol). 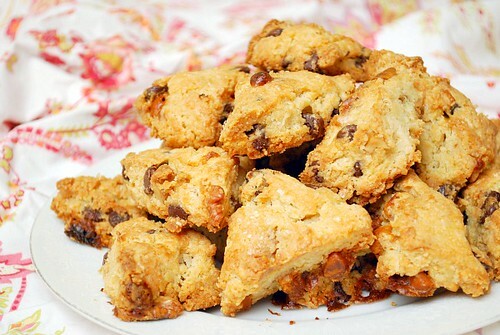 They're perfect with coffee and the combination of chocolate and butterscotch is a sure win! Preheat oven to 375˚F. Line baking sheet with parchment paper unless using a baking stone. In a large bowl blend the flour, sugar, baking powder and baking soda with a pastry cutter. Add the pieces of butter and blend until the flour mixture resembles coarse crumbs. Add the butterscotch and chocolate chips. Stir in the buttermilk just until the dough come together, making sure not to over mix (because it will make the scones tough). Transfer the dough onto a lightly floured surface and form the dough into a rectangle about 1/2 inch thick. Score the dough into 12 even squares - 4 across, 3 rows down. Cut out each square and then cut each square into 2 triangles to create a scone bite. Place the scone bits onto the parchment lined baking sheet. Brush the tops with milk or cream and sprinkle on the raw sugar. Bake in the preheated oven for 7-10 minutes or until golden brown. Remove from oven and cool on wire rack. Looks yummy! It's on the menu for this weekend. Thank you for the recipe!